This has to be the sweetest audio splitter ever created. 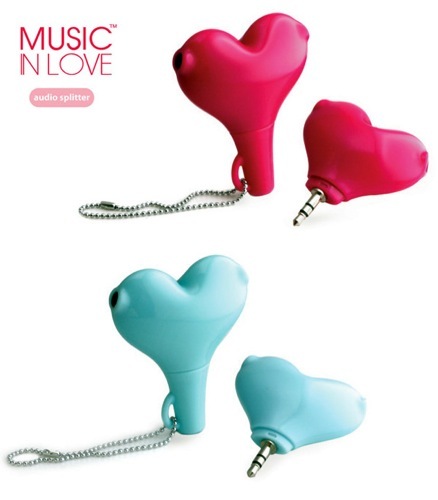 If you’re constantly sharing your music with someone else, then having this small heart-shaped keychain around would be handy. It could always stay dangling from your keychain and it would look like nothing more than a brightly colored little heart. Then just pop off the cap and it’s ready to go. It appears that this comes in bright red as well as a softer blue. Then it has a cap that has a chain attached. In order to plug your headphones in, you just use the two spots on either side of the heart. Unfortunately it’s not exactly being released just yet. Actually, there’s not even any information that it’ll be released at all. You can keep an eye on it though through Fadtronics.